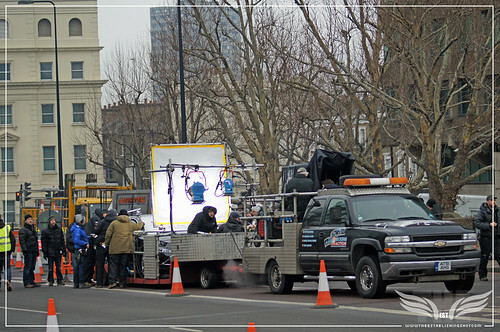 The Establishing Shot: Skyfall Vauxhall Bridge Location Shoot - Skyfall Clapper Board, a photo by Craig Grobler on Flickr. As exciting as it is - I usually wouldn't have made the effort to pop along this far in production and potentially ruining any surprises that Sam Mendes' Skyfall may have in store for us this October. But Vauxhall Bridge is not only as close to modern Bond returning home as we have so far had - as the bridge is in the shadow of the real SIS or MI6 which is where Bond's fictional office is located. 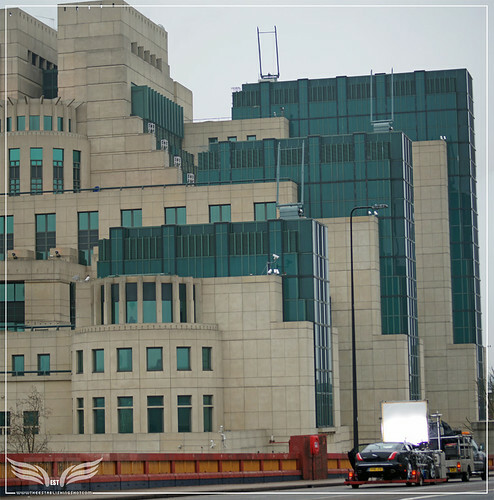 But Vauxhall Bridge holds a particularly personal space in my memories as my first London apartment was directly across the road from MI6, chosen because of its proximity to MI6 and its place in the Bond universe. 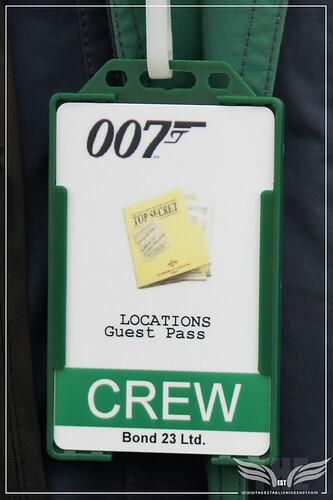 The Establishing Shot: Skyfall Vauxhall Bridge Location Shoot - Guest Pass, a photo by Craig Grobler on Flickr. So it was kind of a big deal for me standing on the bridge watching James Bond history being made again on the bridge I crossed very often. The Establishing Shot: Skyfall Vauxhall Bridge - Judi Dench & Rory Kinnear in M's Jaguar XJL Interior Shots crossing Bridge towards MI6, a photo by Craig Grobler on Flickr. It would appear that the filming that took place on Millbank yesterday, will precede today’s scene. 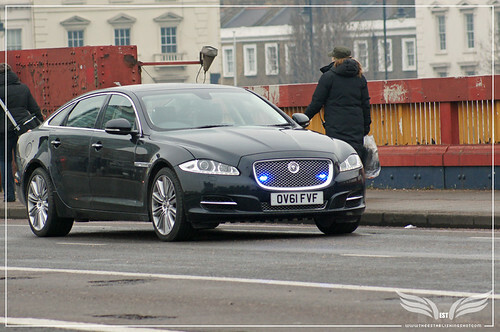 The shoot today showed a grim M sitting next to Bill Tanner on the backseat of a Jaguar XJ L. Tanner is moodily checking his phone and making/receiving a call whilst their Jaguar’s discrete blue lights warns other cars of their high speed as they weaved through traffic across the bridge. 23 Unlimited recreated a day on the bridge with traffic including a London 88 bus, sightseeing pedestrians and a single lone cyclist. This is the first time Vauxhall Bridge has been closed for a film shoot and traffic was closed on both ends whilst the team filmed exterior shots of the Jaguar racing across the bridge with stand in actors. 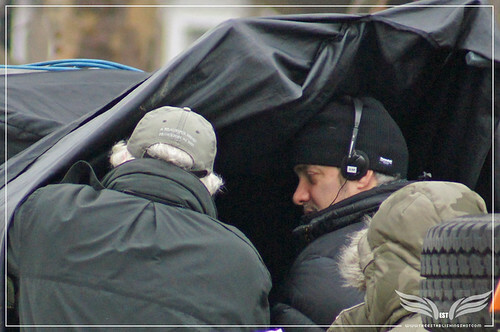 Renowned cameraman Pete Cavaciuti handled the Steadicam shots with Legendary Cinematographer Roger Deakins, sporting A Beautiful Mind crew cap overseeing this part of the shoot. The Establishing Shot: Skyfall Vauxhall Bridge - M's Jaguar XJL Exterior crossing towards MI6, a photo by Craig Grobler on Flickr. The Establishing Shot: Skyfall Vauxhall Bridge - Judi Dench & Rory Kinnear in M's Jaguar XJL Exterior Shots crossing Bridge towards MI6, a photo by Craig Grobler on Flickr. 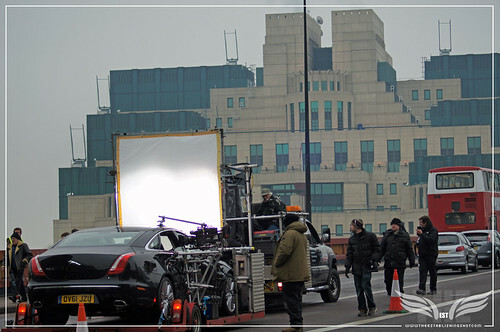 The Establishing Shot: Skyfall Vauxhall Bridge - Crew for M's Jaguar XJL Exterior crossing towards MI6 Steadicam Operator Pete Cavaciuti, a photo by Craig Grobler on Flickr. 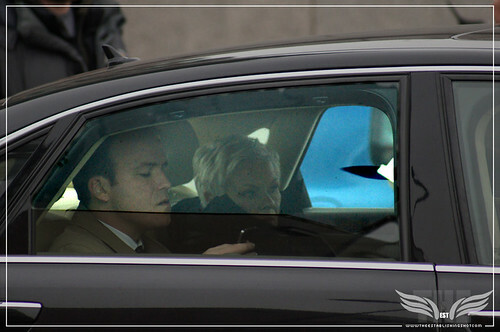 Then the Jaguar was placed on a trailer, Dame Judi Dench (M) and Rory Kinnear (Bill Tanner) took their places in the back seat of the Jag, a camera was added to Kinnear 's removed window and the same run was done again whilst this time the interior of the car was filmed. Both Sam Mendes was Roger Deakins were very hands-on setting up, checking and then shooting from the head of the trailer. 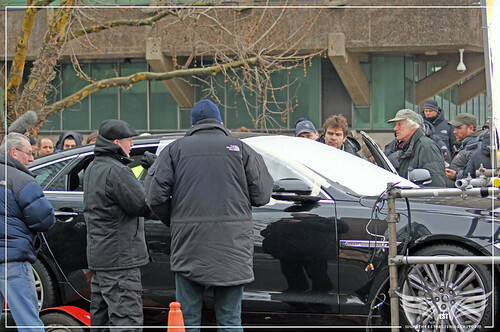 The Establishing Shot: Skyfall Vauxhall Bridge - Prepping M's Jaguar XJL Interior Shots crossing Vauxhall Bridge towards MI6 Sam Mendes L, a photo by Craig Grobler on Flickr. 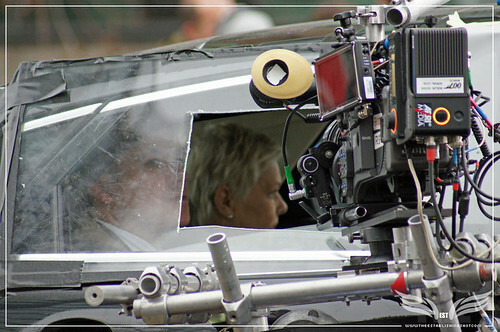 The Establishing Shot: Skyfall Vauxhall Bridge - Prepping Judi Dench Jaguar XJL Interior Shots crossing Bridge towards MI6 - Cinematographer Roger Deakins, a photo by Craig Grobler on Flickr. 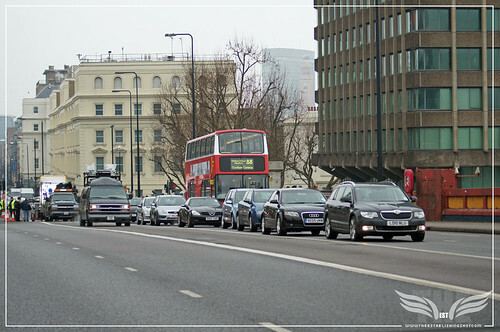 The Establishing Shot: Skyfall Vauxhall Bridge - Judi Dench & Rory Kinnear in M's Jaguar XJL Interior Shots crossing towards MI6, a photo by Craig Grobler on Flickr. The Establishing Shot: Skyfall Vauxhall Bridge Location - Roger Deakins & Sam Mendes checking shots, a photo by Craig Grobler on Flickr. There were a number of high security metropolitan police actors on the scene, but there was no indication as to what their role might be in Skyfall. 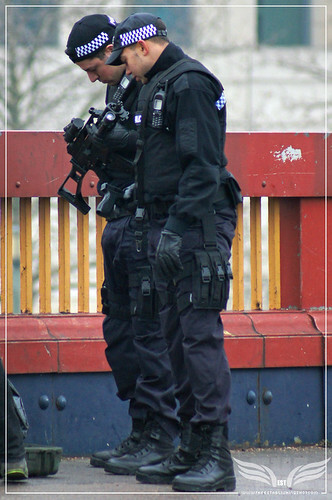 The Establishing Shot: Skyfall - Vauxhall Bridge Location - Metropolitan Police Officers getting their prop Heckler Koch MP5s from the propsmaster, a photo by Craig Grobler on Flickr. As for what might be causing the usually very cool as ice M to rush to MI6? Speculation on set was that Skyfall might well be a threat to London itself! Which ties in well with the use of so many UK and specifically London filming locations. 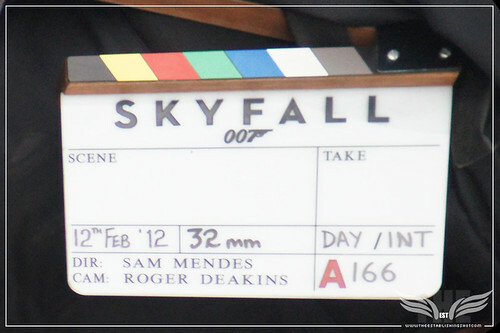 Skyfall has been in prepping in Turkey and shooting will start over there soon.